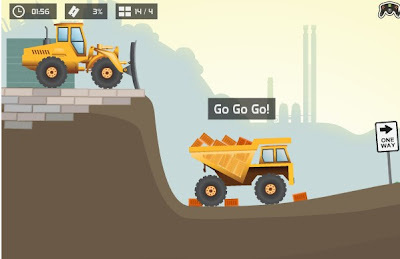 Max Dirt Truck is another point A to point b delivery game from maxgames. Featuring more than 10 different levels to try your physics thing on and various achievements to unlock. Deliver the supplies to the factory within the time limit. Hold on to your hats, because this ride is going to get bumpy! Study the contour of the ground and pay attention to sings - it may be a hint for you to slow down or tilt forward or backward. Anyways, here is the first part of the MDT Max Dirt Truck walkthrough showing levels 1 to 3.